Really?? She is writing a multi part piece about "Pennsylvania the Beautiful" and she is going to start with McKeesport, PA? Well, listen, that's where we started our trip so it probably makes sense to start there. I don't recommend McKeesport particularly as a vacation destination, but if your mother in law lives there, and mine does, it can be a tolerable place to visit. 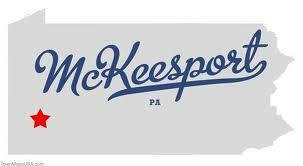 McKeesport, PA is located in Allegheny County in southwestern PA, at the confluence (Stanford word) of the Monongahela and Youghiogheny Rivers. Pittsburgh, PA is the nearest big city and is also your airport of choice. McKeesport was established as a city in 1891. It's population steadily grew until 1940, at which time the population peaked at 55,355 but it has steadily and rapidly declined since to today's population of 19,686, attributable to, and I quote Wikipedia here, "the general economic malaise that descended upon the region when the steelmaking industry moved elsewhere." Poor McKeesport. It's like a place that time forgot. The median household income is $27,073 and the median house value of a detached house is $54,180, but if you chose to live closer to downtown, and want a real charming fixer upper, you can get a 3100 sq ft. house for seven thousand. The short drive down Versailles Ave. to the lovely Holy Dormition church where Mom T. has prayed since she was a child is fraught with abandoned and boarded up houses. She takes another road now. It wasn't always this way. My husband has great memories of growing up here. It just has seen better days. Anyway, the flip side of all this is that whenever we come we have an amazing time. It's not always the best location, but making the best out of any location. In the time we were here, we found places and ways of creating quality family time, which was the whole reason we were visiting McKeesport in the first place. Oh Kennywood. Everytime we have come to Pennsylvania we have come to Kennywood. I would have to say that Kennywood IS the only reason to travel to these parts unless you are doing anything but visiting family. 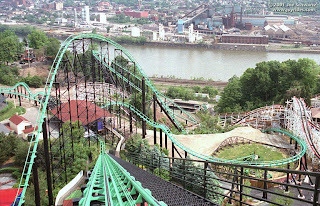 Kennywood is an amusement park located in the borough of West Mifflin and is built on the bluff overlooking the Monongahela River. The park, which was originally being used as a "trolley stop" for the Monongahela Railroad, was acquired by F.W Henniger and Andrew McSwigan in 1906 and has been in business for over 100 years. One of the charms of Kennywood is the fact that many of the rides and structures date back to the early 1900's. Kennywood is also a US National Historic Landmark. It costs an adult $39.99 to get into Kennywood. If you are an adult is based on how tall you are. If you are 46 inches tall, which my kids have been since they were like four, you are an adult. When we were there, the fact that we had to buy five adult tickets was mitigated by the fact that we got discount tickets at the local Giant Eagle, saving us $13 per ticket. Once you get there, free parking is available. Kennywood boasts three wooden roller coasters, two of which date back to the 1920's. 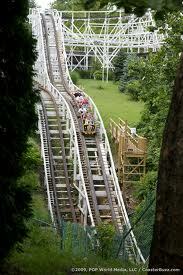 The Jackrabbit is famous for its "double dip" which throws you out of your seat just as your photograph is being taken. Another thing I love about this ride is its 36" height requirement which means Nicholas could have ridden it while still in diapers! We didn't let him. The Racer, which was built in 1927 sends two cars out simultaneously, suggesting that the two cars are racing. Some riders take it very seriously. Thank God I have taught my children not to base their self worth on whether or not they win roller coaster races. The Thunderbolt, my husband's all time favorite roller coaster, was built in 1968. Its unique feature is it's immediate drop out of the start station, with the lift hill in the middle of the ride. It also features two sharp turns which cause the rider to lift out of the seat and smash the poor soul seated in the left seat. The Thunderbolt is the only ride requiring you to ride with a partner, heavier partner to the left. Kennywood also has a mammoth steel coaster called The Phantom's Revenge. This is the roller coaster that tips the scale of what I can tolerate to ride. There are no inversions, but there are two wicked drops, one 160 ft and a second even longer at over 200 ft, at the bottom of which the ride reaches its maximum speed of 85 mph. It's lots of fun, but at the end I am both proud to say I rode it, and happy it's over! Kids, are you really going to make me ride it again??? All these rides are much scarier and dare I say faster at night. Kennywood coaster engineers took advantage of the hilly area to build tracks into the valleys and slopes of the bluff as it descends down to the river. At night these chasms become very dark and it is very difficult to see the track in front of you, creating an extra thrill. The Phantom's Revenge's second drop actually passes through the supports of the Thunderbolt's first drop-very cool. One word of advice however is to avoid the front seat after dusk. Bugs are far more plentiful in Pennsylvania, especially near water. Kennywood features rides that are typical of many amusement parks and also some that are the only of its kind, such as the Kangaroo. The Turtle has been there since 1927. Noah's Ark has been there since 1936--it's quite campy. There are water rides, namely the Pittsburgh Plunge and the Roaring Rapids, that get you so wet (which can actually be great during the hot and humid PA summers) there are actually whole body dryers available nearby. There is also the very cheesy 3-D black light Garfield's Nightmare and the newly renovated Ghostwood Estate, which scores your ability to shoot at "unwanted spirits!" One of the coolest "so not California" things that Kennywood features during the summer are "Nationality Days," This custom has been in practice since the early 1900's. You would never see Persian Day or Jewish Day at a CA amusement park; someone would definitely raise an eyebrow, but at Kennywood, remembering that this is Western PA, there is Croatian Day, Slovak Day, Polish Day, Hungarian Day, Asian Day, Native American Day, Slovene Day, and Greek Day--just to name a few. We have been twice on Italian Day, which is the busiest Nationality day. This year we thought it might be interesting to go on Byzantine Day (what makes one Byzantine? We didn't know but we thought we might fit in!). My Mother in law's uncle met his wife at Kennywood in the 1940's on Russian Day! Now when we went nothing about the park was particularly Byzantine--the days I suppose just give ethnic groups a chance to get together. Sometimes there are picnics/shows/church services/food at the pavilions put on by specific ethnic groups, but not always. Anyway, I think it's cool. Well, if you ever feel the need to get to a big city while stationed in McKeesport, 20 minutes away is Pittsburgh. There is lots to see in Pittsburgh, including the Carnegie Science Center, Heinz Stadium, PNC Park, Fort Pitt, Station Square, and the Cathedral of Learning. This time in Pittsburgh was my first time visiting the Monongahela Incline. The incline was built in 1870 to transport the labor force of predominantly German immigrants down from their homes on Mt Washington to the industry of Pittsburgh down by the river's edge. 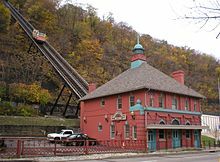 It is the oldest continuously operating funicular in the USA and is one of the two remaining inclines of the original 17 built in Pittsburgh in the late 19th century. Though some still use the incline to get to work, today it is mostly a tourist attraction, as the views of Pittsburgh from the top of Mt Washington are quite spectacular. The ride is also quite hair raising as it gains 369 feet of elevation at a 35 degree angle at a snail's pace of 6 mph while being pulled only by a cable (how many people are in this car??). Anyway, it costs adults $2.50 to go both ways and kids 6-11 $1.75. Seniors and younger riders are free. As mentioned before, those PA summers can get quite hot and yucky and when you've got kids sometimes you just have to lead them to water. 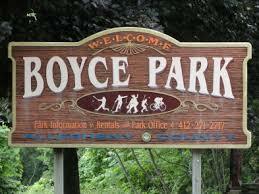 Luckily a short drive to Monroeville will get you to the Boyce Park Wave Pool. 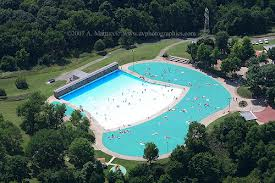 The wave pool is just a part of a much larger Allegheny County park. This place is a little quirky in that there is no lawn, but rather astroturf, which can get quite hot and, need I say it, hard. There is also very little shade. There are also a few funky rules like no food or drink allowed on the astroturf, no in and out of the paid pool area, and no lawn chairs. Whatever. The pool is large and refreshing and the waves are really big! The waves are generated from both the back and the sides of the pool making waves that are much more ocean-like, making the swimming far more challenging. Lifeguards are on duty! And what a deal! Adults are $5, Juniors 13-17 $4, and Youths 6-12 $3. Both one and two person rafts are available for rental--$4 plus a $1 refundable deposit. Well this has gotten rather long so I better divide this post into two. Now let me add some pictures and get this posted!